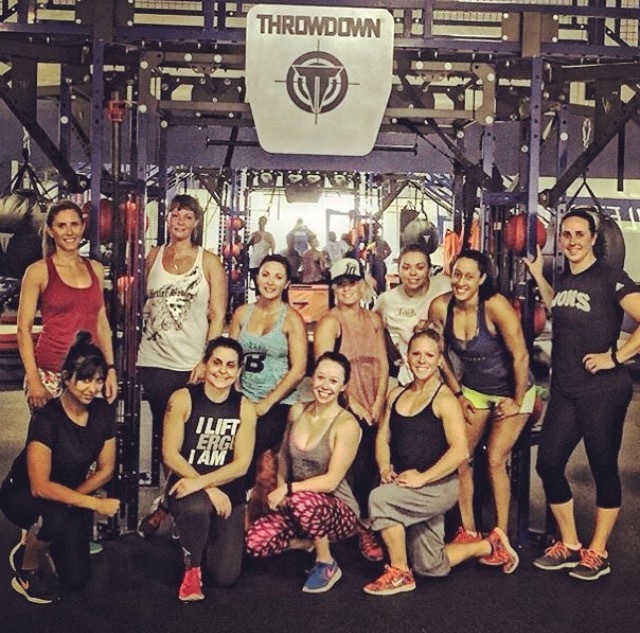 I know the world of IIFYM (if it fits your macros) aka Flexible Dieting can be information overload for someone who is just starting out. 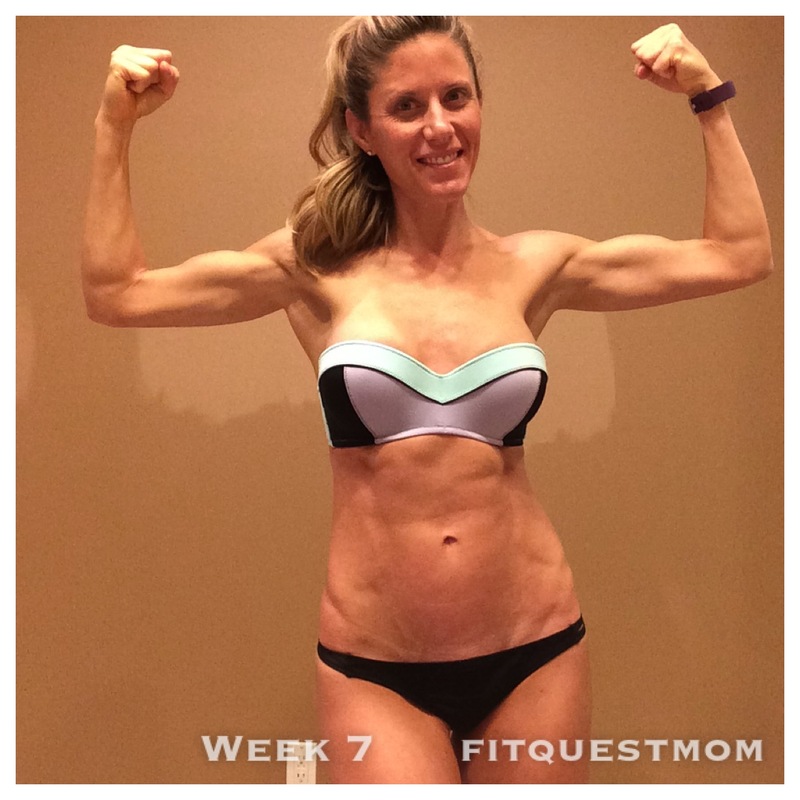 It was for me, and I have been working in nutrition for years. 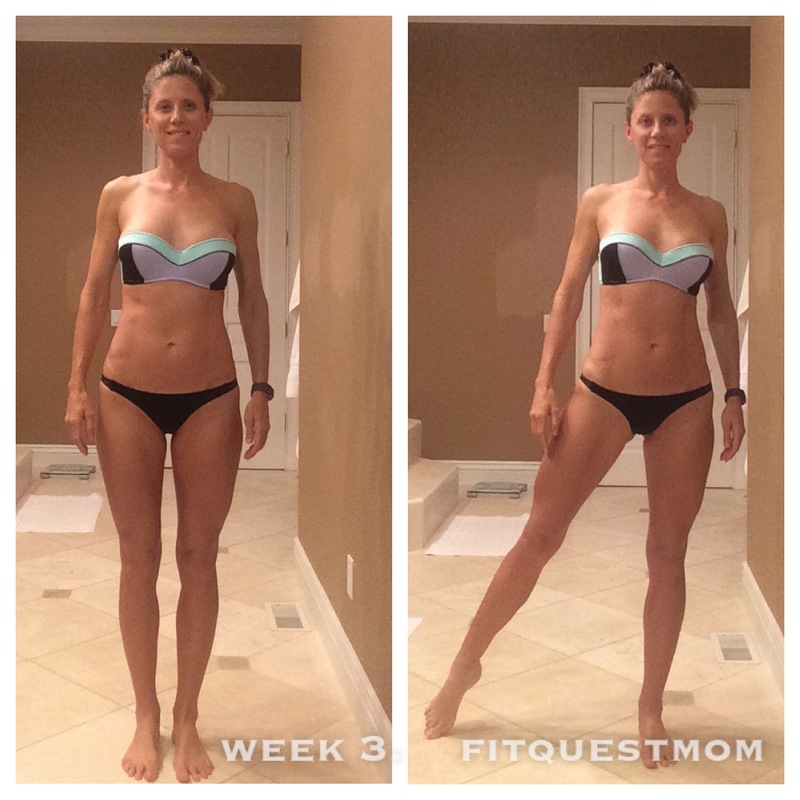 There is no getting around the steep learning curve, but I thought I’d try and write a few posts detailing the “hows” of IIFYM. 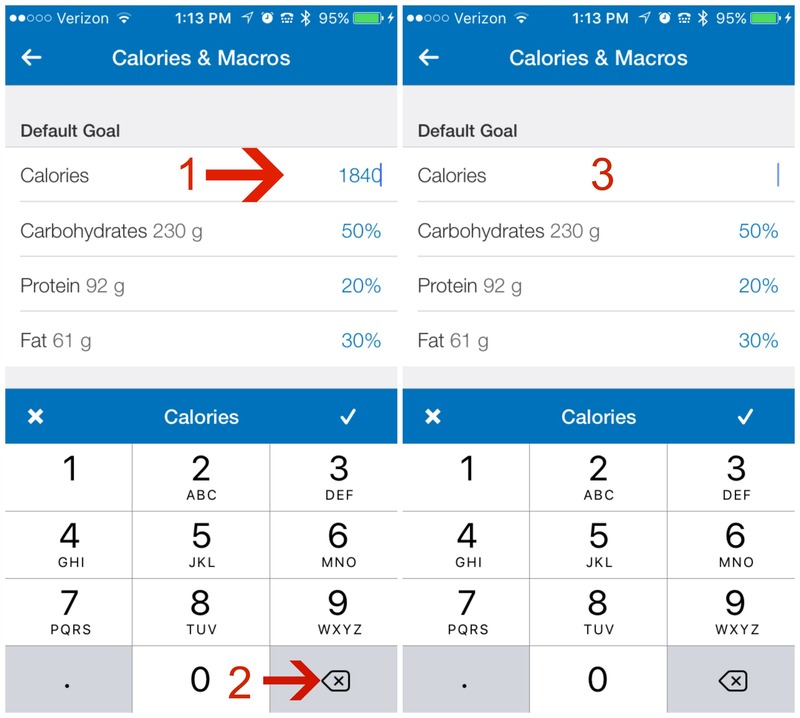 I want to tackle how to track your macros in My Fitness Pal (MFP) and my first post in this series will detail how to set your particular macros in MFP so you can more accurately track them. 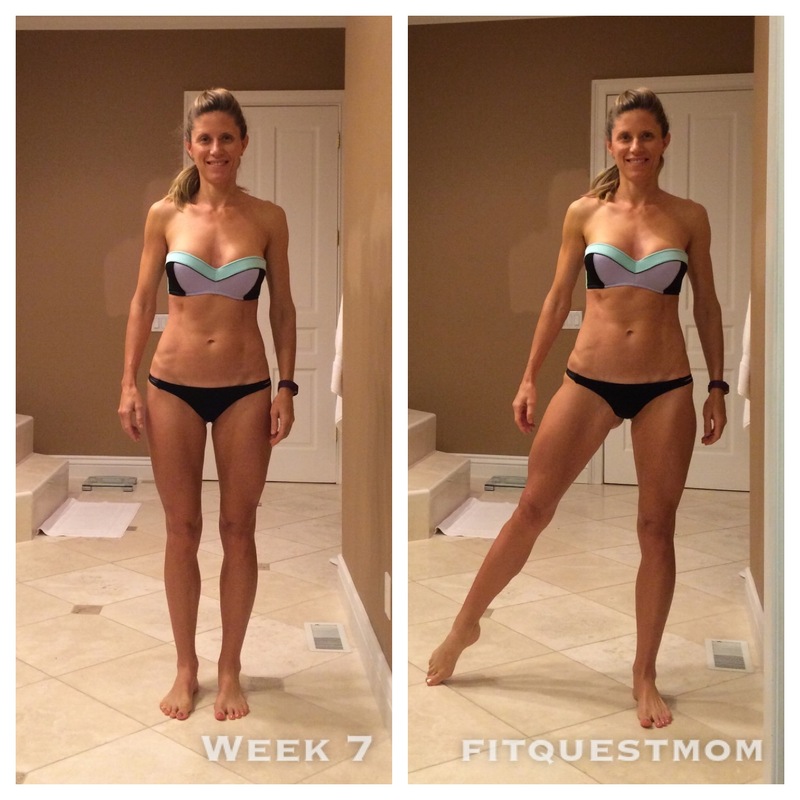 How you do this will differ depending upon which level of MFP you have; the free version or Premium ($49.99/year). I personally have Premium because I wanted the ease of use, the extra features, and because it is an app I am in multiple times a day. In an attempt to give my clients more options when it comes to tracking I did recently download My Macros+ (it’s only $2.99) and plan on posting tutorials for that app as well in the future. The image (above left) is of the MFP homescreen. At the bottom you will see where I arrowed in red to the “MORE” area. Click on that and it will take you to the “More” screen (above right). Once in the More screen click on the “Goals” section. Once in the “Goals” section click on the “Calories & Macronutrient Goals” area which will take you to the “Calories & Macros” screen (above right). 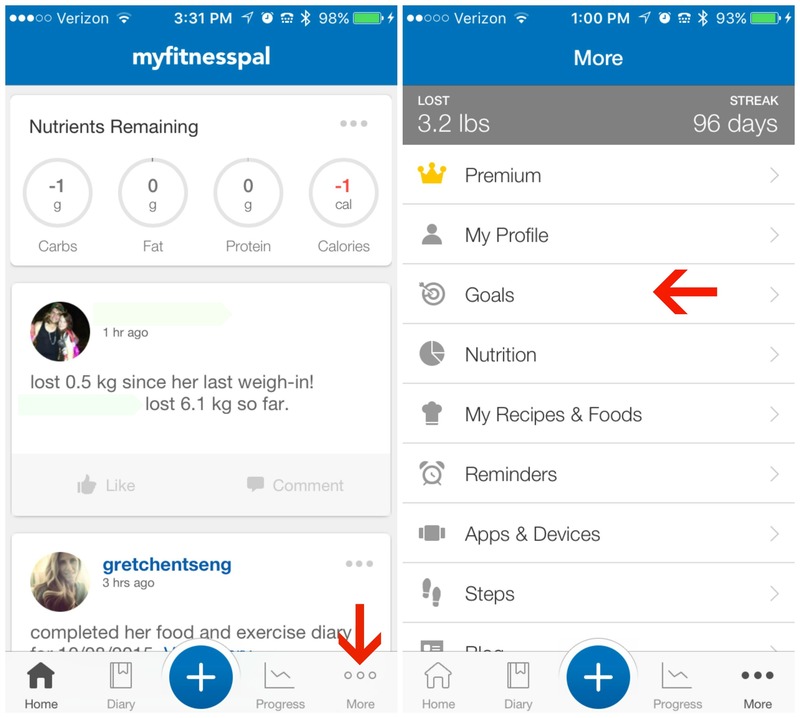 You will see that MFP provides you with a “Default Goal” based on the questions it asked you when you first logged in. 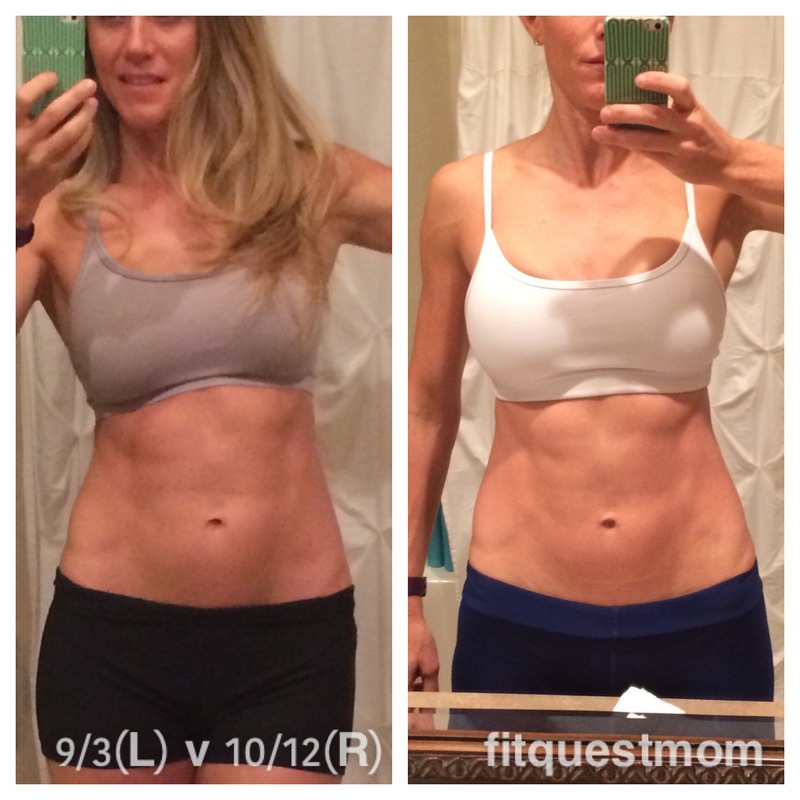 When you work with me (Click HERE to learn more) I provide you with prescribed macros. 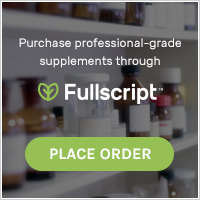 If you would like to attempt to set your own macros you can go to sites like BodyBuilding.com for their Macro Calculator. 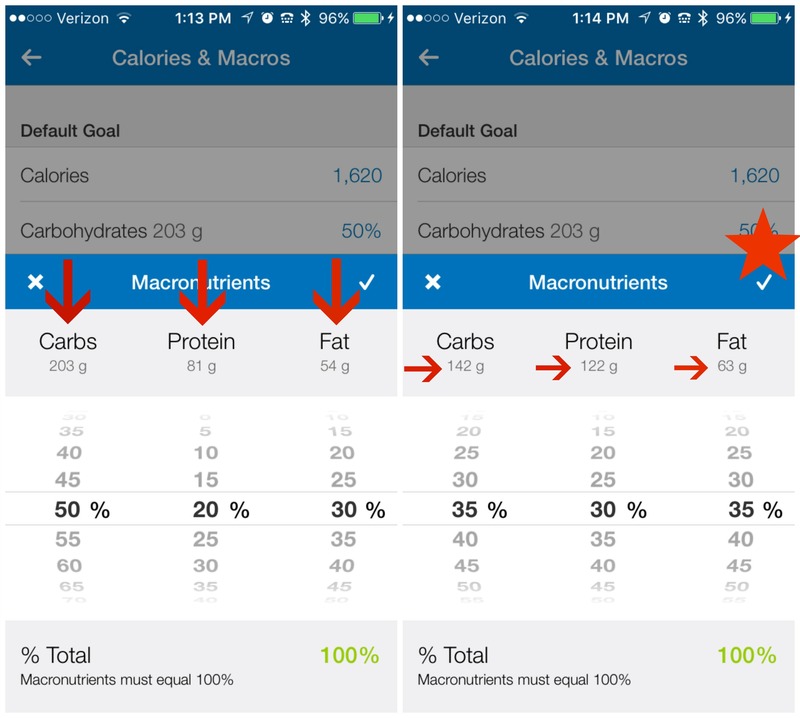 Once you have your macros you will need to amend the calories (above left). Click on the calories (1) and a number screen will pop-up. 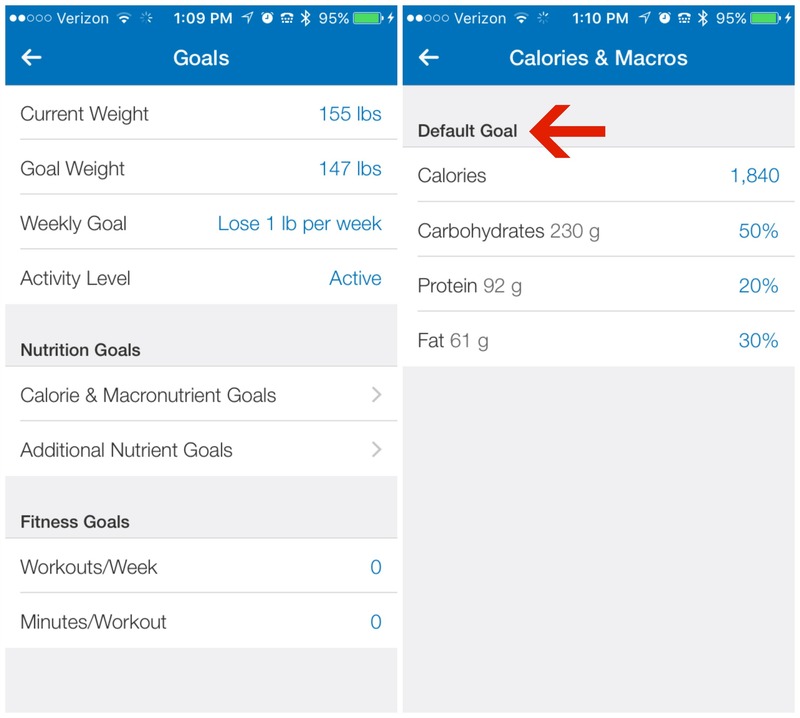 (2) Delete the “Default Goal” calories and (3) enter in the calories you should be eating. This is literally the ONLY time you should ever worry about calories because from here on out all you need to do is hit those daily carb, protein, and fat macros regardless of whether that puts you OVER or UNDER your calorie goal…it does not matter…MACROS, MACROS, MACROS. Once you have entered the appropriate calories hit the “check mark” to save them. Now click on either “Carbohydrates 203 g”, “Protein 81 g”, or “Fat 54 g” and the screen below left will pop-up. 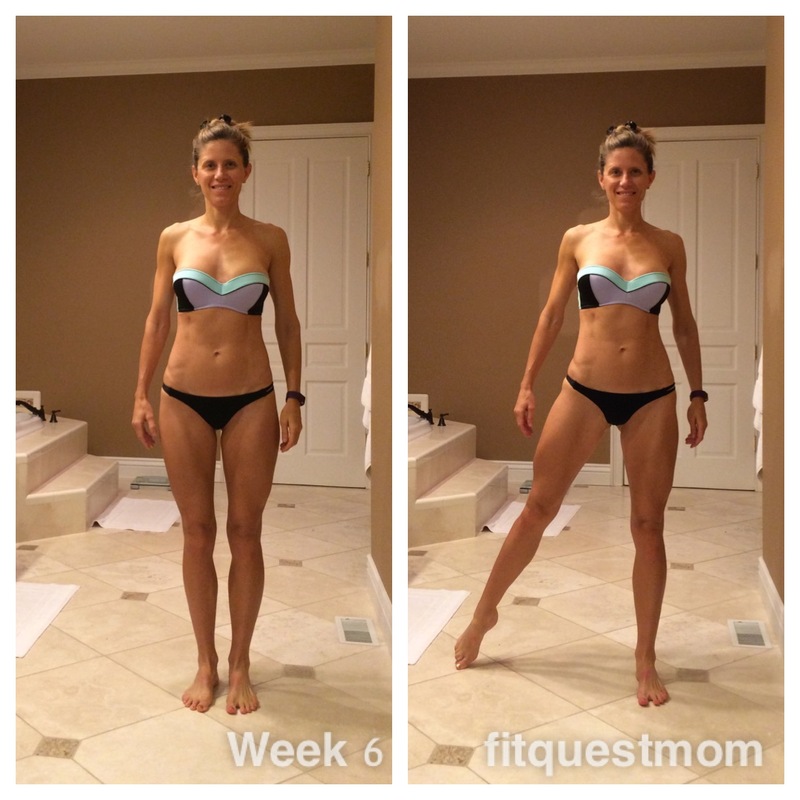 Scroll through the “Carbs” percentages until it is NEAR what your prescribed carbs should be. Remember, this is not Premium, so you can’t get exact on the grams. 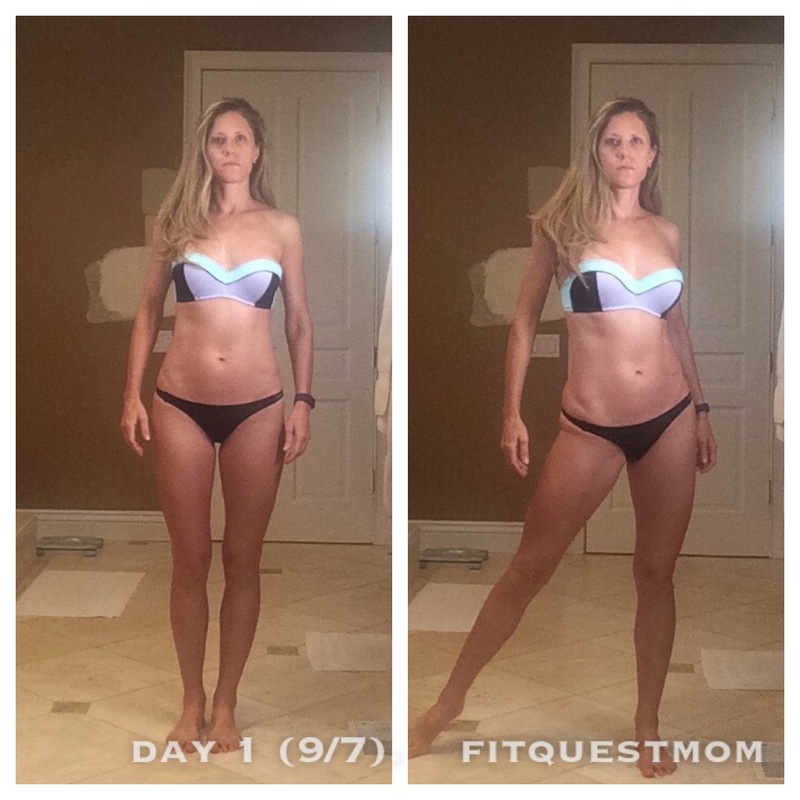 Do that for “Protein” and “Fat” as well and remember that the “% Total” (bottom right of the screen) must equal 100%. 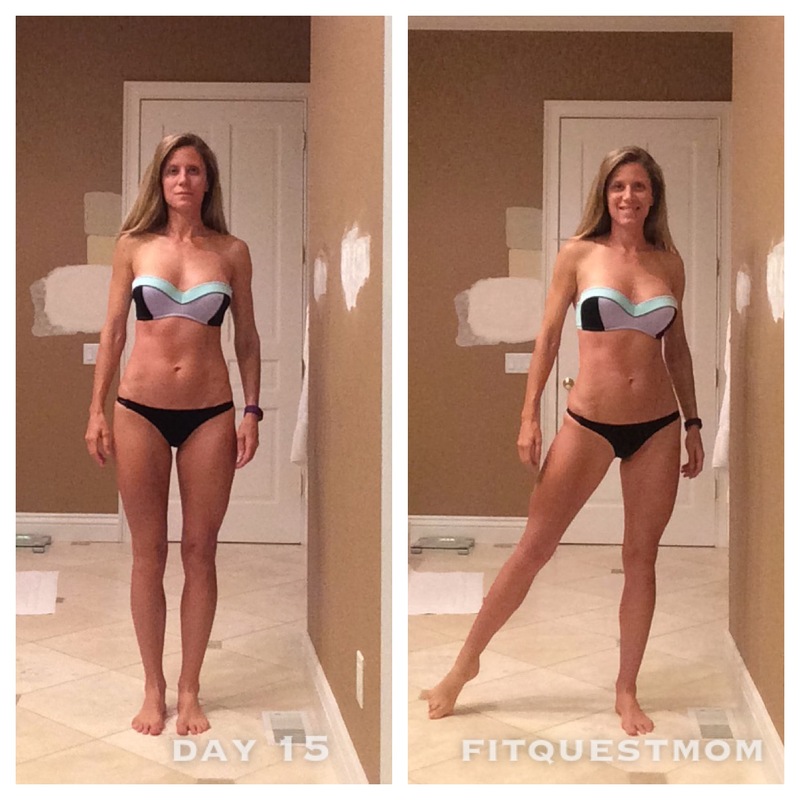 In this example, my client has prescribed macros of 1620 calories 140C/130P/60F. This means that our “Close Enough” ended-up being 1623 calories 142C/122P/63F. Does that mean my client will eat the “Close Enough” macros??? NO. 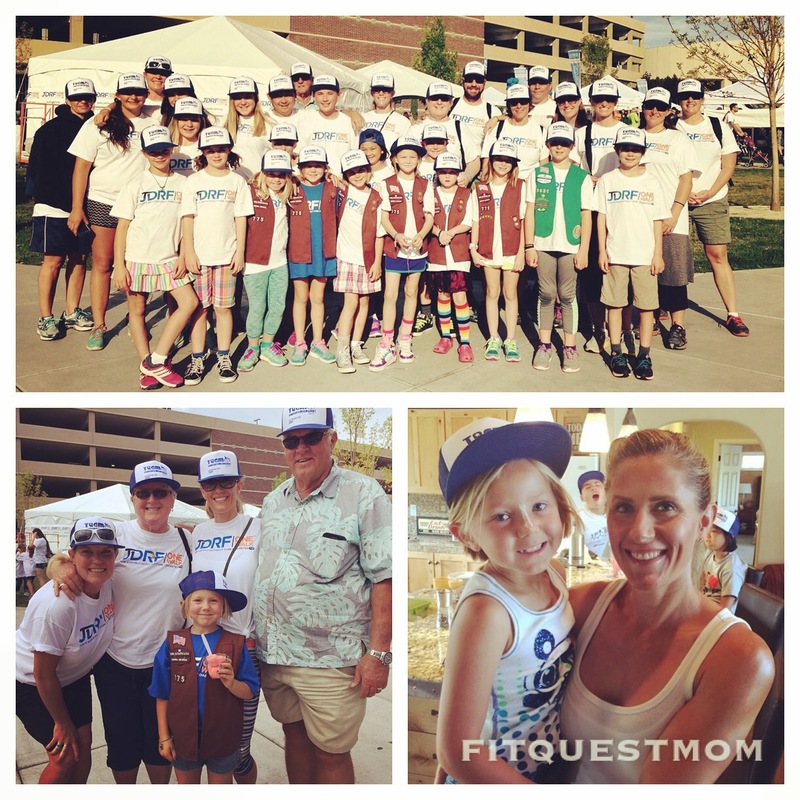 She will just have to remember what the macros that I gave her are…this is the downfall of the Free MFP service, but you all are more than smart enough to remember your macros. 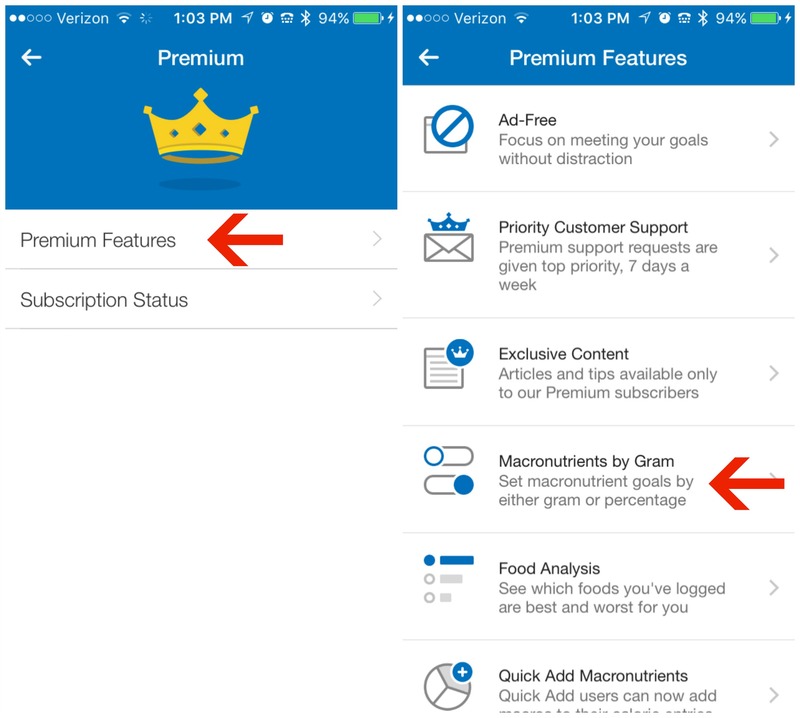 For the Premium version of MFP, to set your macros go to the Homescreen, click the “More” button on the bottom right (left screen above) and then click on the “Premium” button (top right screen above). Once you are in the “Premium” screen (left screen above) click on the “Premium Features” tab and it will bring you to the “Premium Features” page (right screen above). Once there click on the “Macronutrients by Gram” tab. 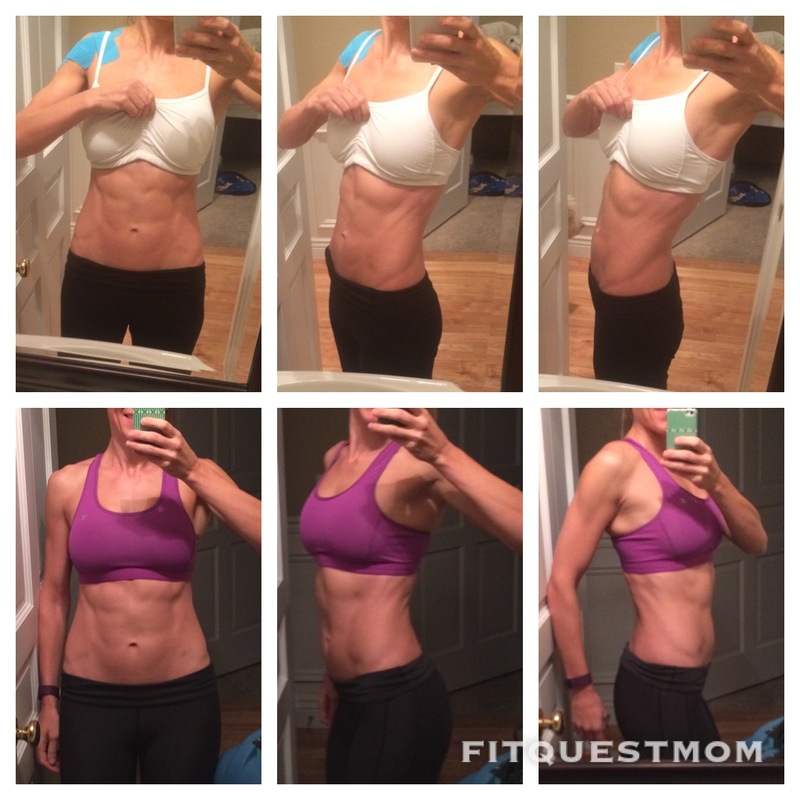 This will bring you to the “Calories & Macros” page. 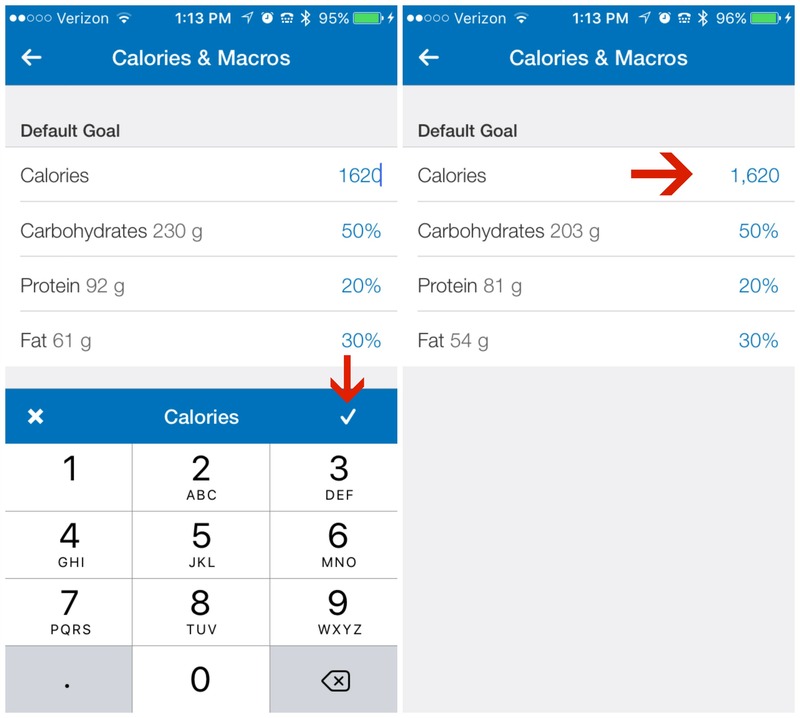 Set your calories as described above in the FREE MFP Tutorial. Then, click on (1) “Carbohydrates 32%” tab which will pop-up the image in the above right screen. 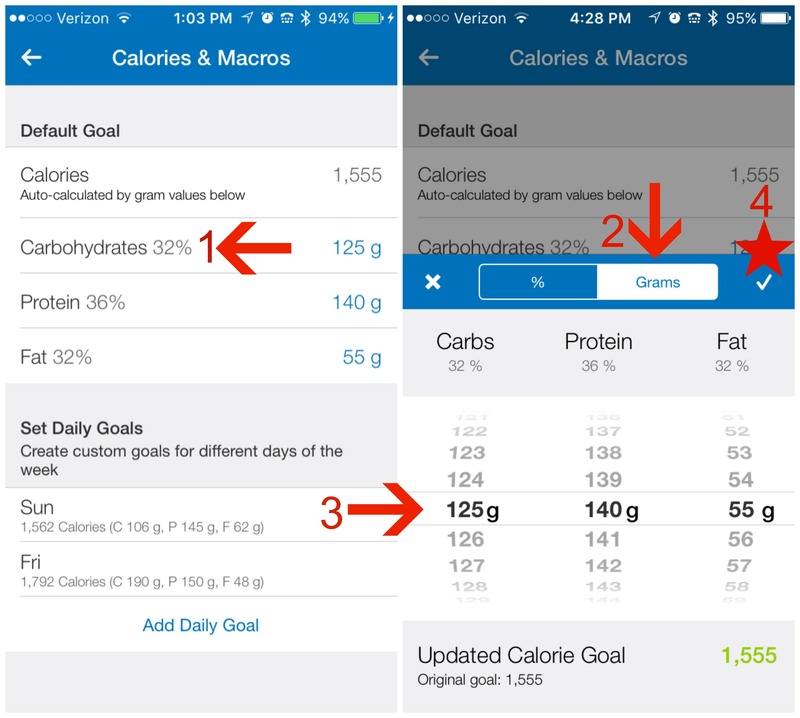 (2) Make sure to click the “Grams” button so you are able to set your macros in specific grams. Once you have clicked the grams button (3) scroll through each macro and set your particular macros exactly as they were prescribed. 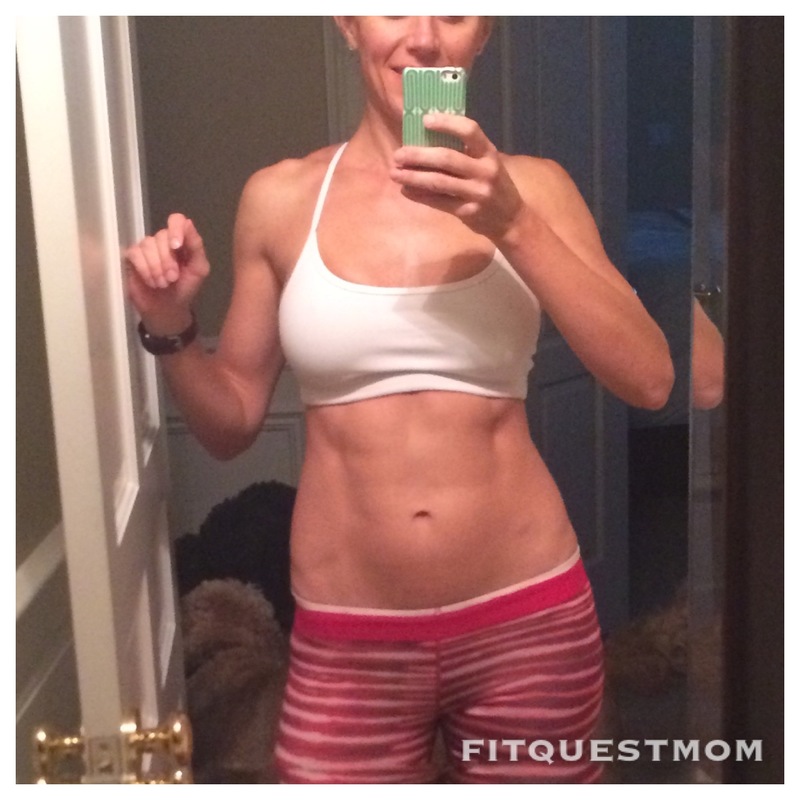 Remember to (4) click the check mark to save your macros. 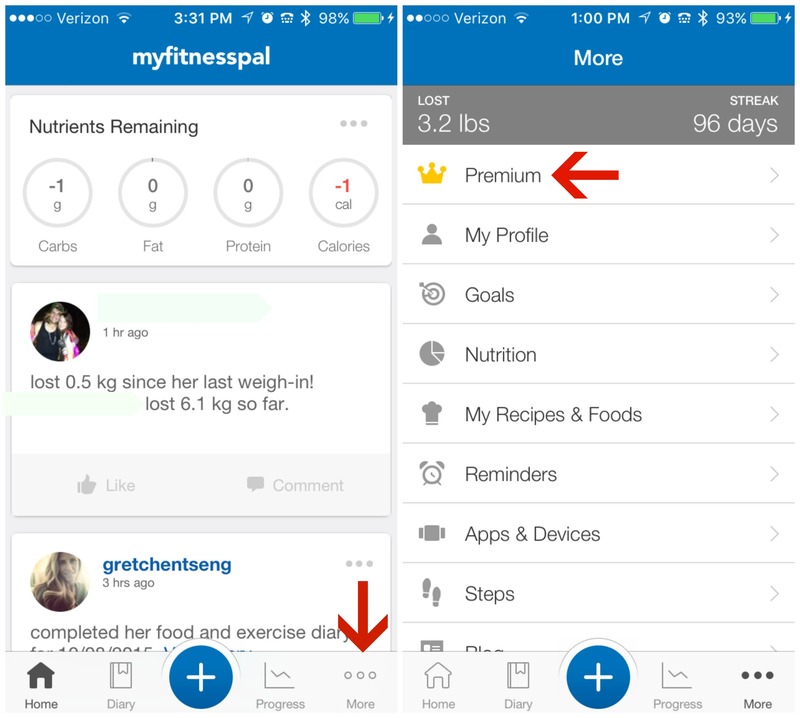 Premium MFP has another neat feature which is great if you are carb-cycling. Carb cycling means that your macros are different on different days usually in relation to the level of training you will be doing that day. For example, my highest carb day is on my heaviest leg day (weight lifting). 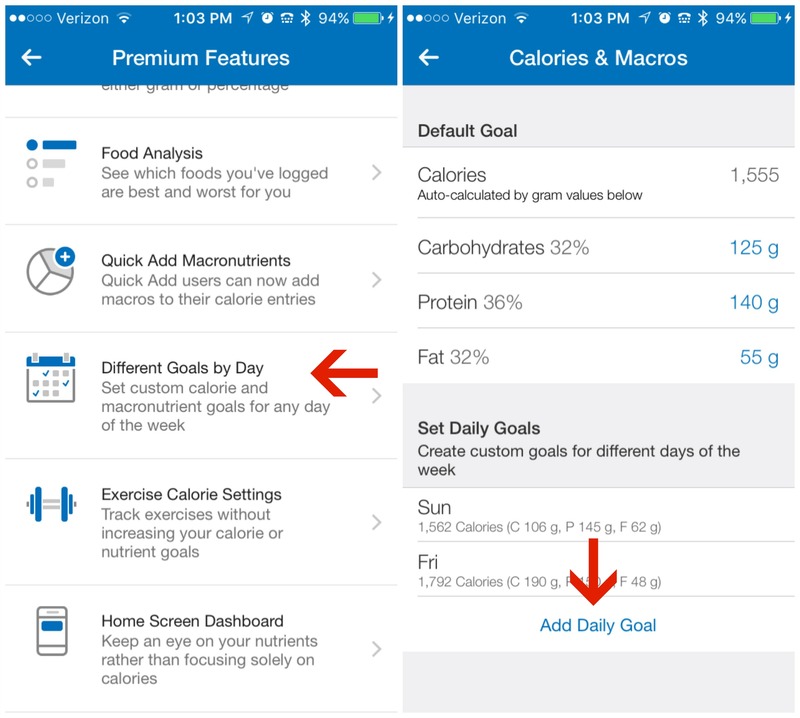 The “Different Goals by Day” feature above allows me to pre-set those macros for those days that are different than my normal days and I do not have to remember to switch them in MFP on those days because they automatically pop-up (nice run-on sentence, huh?). 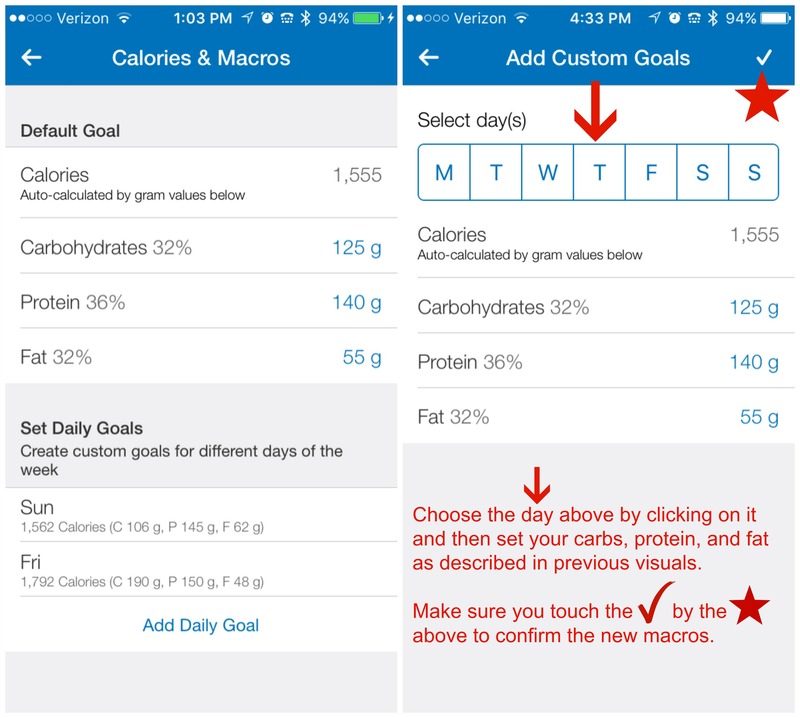 To set the macros for those days that do not fit your default days, click the “Add Daily Goal” button (above right screen). And that my friends is how you set your daily macro goals in My Fitness Pal. My next tutorial will detail how I go about planning my macros for the day food-wise and how I am able to hit them usually dead-on or within 2 grams either way. This past week was a good one, though it was the first week I experienced some hunger. 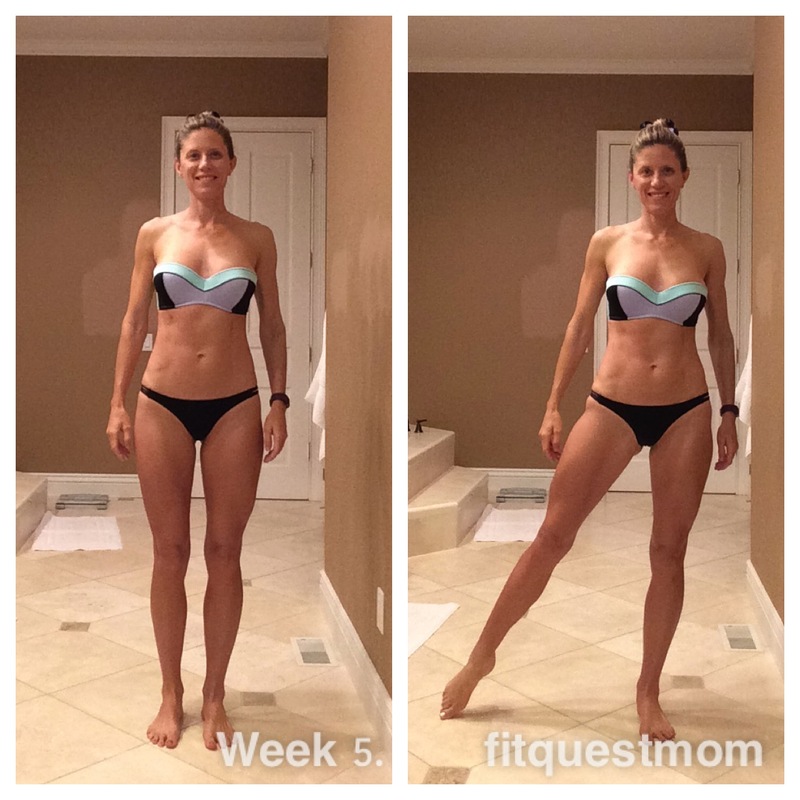 My goal during this 8 week “cut” is not to lose a ton of weight. 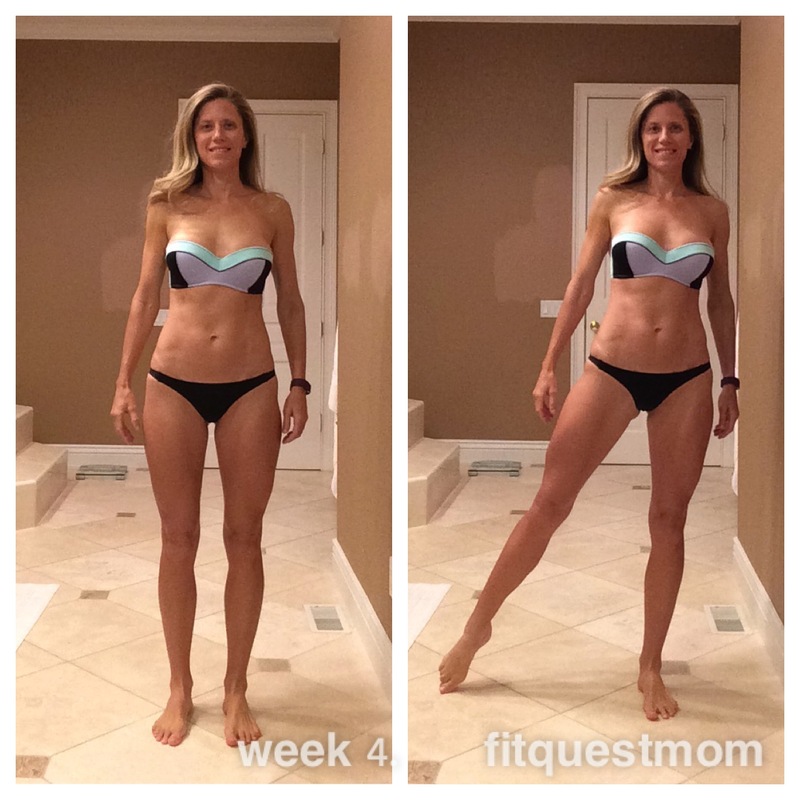 My weight loss has been a bit ahead of schedule, so I am actually adding in a little more food this week and will see how my body responds to that. If by Friday I am still losing weight at a more rapid rate than I would like, I will make my refeed larger than planned.